Update – 1/7/2015 – Buildings included in yesterday’s first photo now rubble. 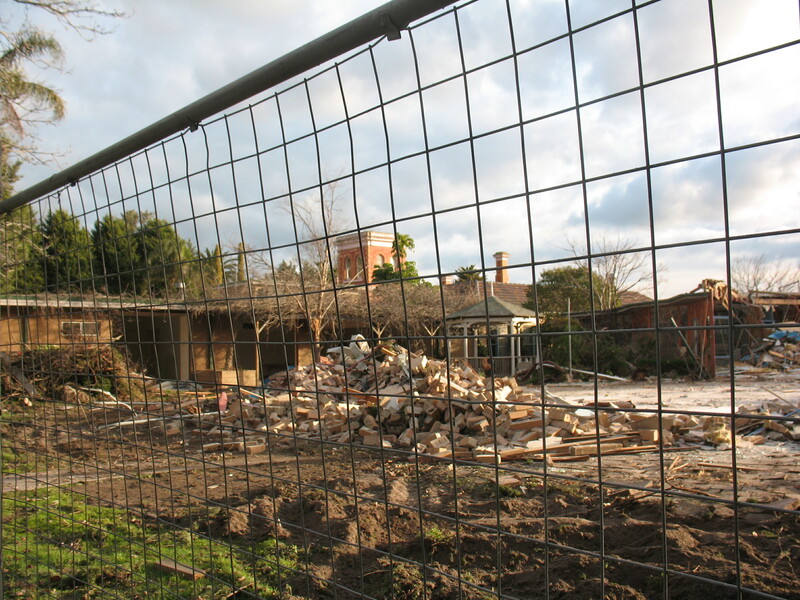 It appears the Victorian Department of Planning is “caught up in red tape” and even though aware that demolition is imminent, has yet to review Glen Eira Council’s highly questionable decision to abandon heritage protection for Frogmore House. Surrounding residents’ report that Frogmore House currently remains externally intact, however, internally doors, stairs and various other fittings have been removed. Their “D-day” estimate, based on progress to date, is that Frogmore may well be “gone” by the end of the week (at the latest early next week). Apparently, the slow pace of the Department of Planning is attributable to a need for a specific rationale for a State Government Department to get involved in a decision that has already been made by another level of government. Of course GERA believes that Glen Eira’s decision to abandon the heritage protection doesn’t stand up to planning scrutiny. The arguments presented on this site have also been presented to the Minister (14/6), together with relevant documentation (ie. January, 2015 Council commissioned Heritage Advisor’s Report and Recommendation, Council’s 3/2/2015 rationale to protect and 9/6/2015 rationale not to protect) and approximately 350 signed form letters from the community. We are also aware of that a large number of our readers (both within the Glen Eira community and the broader community) have also contacted the Department of Planning in support of heritage protection for Frogmore. Given the recently announced State Heritage Review, residents are now wondering why the Department is not making the review of Frogmore a priority. After all in January, 2015 Frogmore was unequivocally recommended for Heritage Protection at the Local Level (historic significance, architectural merit, rarity and associations), yet in making it’s 9/6/2015 abandon decision Council ignored that expert report and reverted to Council’s 2003 dubious decision not to apply heritage protection as Frogmore was not located within an identified heritage area. Frogmore hasn’t moved but heritage standards and social attitudes have. 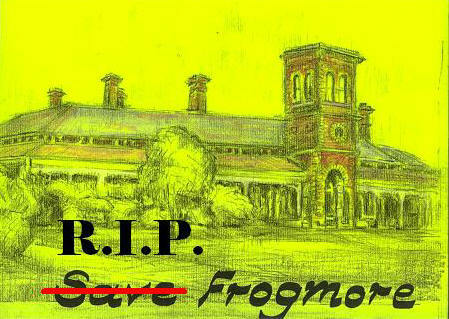 We know it’s a repetitive ask but clearly the above photo’s show that this really is your last chance to save Frogmore. Please contact the Planning Minister to lobby for urgent action. I request that you urgently act to re-instate interim protection for Frogmore while Department of Planning reviews the strategic justifications presented by Glen Eira City Council in support of it’s 9/6/2015 resolution to abandon heritage protection for 1 Wahgoo Road, Carnegie (a.k.a. Frogmore). Less than 10 days after Council’s seriously flawed 9/6/2015 resolution to abandon local heritage protection for Frogmore its days are clearly numbered. Vegetation has been cleared, fences erected and portable toilets installed. Planning Permit (GE/PP-28101/2015) for “Redevelopment of existing site for a new residential aged care facility” has been lodged. As per our previous posting, GERA has been lobbying, Richard Wynne, Minister for Planning, to act to re-instate interim protection for Frogmore, to enable his Department’s review of the strategic justifications presented by Council in support of it’s 9/6/2015 abandon heritage protection resolution. Clearly, time is of the essence and we again urge the community to email or call the Minister to request him to act. PLEASE EMAIL OR CALL NOW – otherwise, the next time you hear of Frogmore it will be in a demolition announcement. 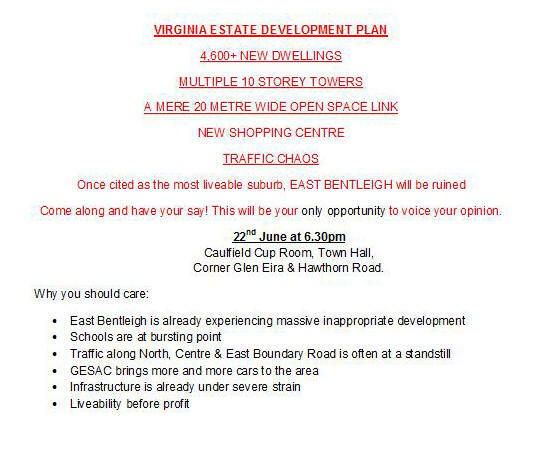 The following meeting notification, prepared by residents opposing the Virginia Estate Development, is provided to highlight a Planning Conference this coming Monday (22/6/2015). Late notice we know but apparently few residents are aware of the significance of this proposed change. This Planning Conference is related to Planning Scheme Amendment C135 which “proposes to rezone part of the land to Commercial 1 to enable an integrated mixed use development over the entire site and amends Schedule 2 to the Development Plan Overlay (DPO2) to enable a broader mix of uses across the site”. Basically, the Amendment seeks to change the parts of the site currently zoned Commercial 2 (ie C2 – Commercial/Retail uses only) to a Commercial 1 (ie C1 – Commercial/Retail and Residential uses) zoning. In lay terms, the significance of this rezoning is that it clears the way for the development to comprise 4,600 dwellings with limited commercial/retail accommodation being provided*. Thus the opportunity to live and work locally will be significantly reduced (decreased employment opportunities) and will add to the above adverse amenity impacts of the current development plan. if possible, attend the Planning Conference. I wish to lodge a formal objection to the above amendment and request several changes to the amendment. 4,600 units represents an over development of the site and should be substantially reduced. This can be achieved by changing the zoning to General Residential instead of Commercial 1 as proposed. the area is poorly serviced by public transport and will result in more traffic chaos and until this is addressed the development should not go ahead. Setbacks to East Boundary Road should not be reduced. They should be increased. Ten storey apartment towers do not fit in with neighbourhool character. No higher than three storeys to be built. A 20 metre wide linkway is not adequate open space provision and the amendment needs to be altered to reflect an appropriate land contribution from the developer. Size of the apartments should be larger than planned. That the developer be required to pay more than 5.7% in an open space levy. * The balance between the two (ie. commercial/retail vs. residential), being determined by the developer’s assessment of the most viable option as the project progresses – as shown by the Caulfield Village Development, residential accommodation returns a higher yield than commercial/retail accommodation. We regret to inform readers that at last Tuesday’s (9/6/2015) Council Meeting, Councillor’s resolved to withdraw/abandon heritage protection for Frogmore via the planning scheme amendment process (ie. heritage overlay). Thus, Frogmore’s future will now be inappropriately determined by a planning permit approval process which does not consider heritage unless that heritage has been previously recognised via a heritage overlay. Historic Home to face the wrecking ball – 11/6/2015 – Magic1278 (linked added 16/6/2015). Glen Eira Leader – articled added 16/6/2015. does not give appropriate consideration to the heritage retention values shown by the significant community support for the preservation of Frogmore. These amendments were initiated by residents (ie. a petition comprising approximately 1,000 signatures) in December, 2014, and resulted in a Council decision to commission an Independent Local Heritage Assessment of Frogmore. Council defined the Assessment’s terms of reference. On 3/2/2015, based on the findings and recommendation of that Independent Local Heritage Assessment, Council initiated amendments C136 (Interim Protection) and C137 (Heritage Overlay, ie. permanent protection). “Frogmore is significant to the locality of Carnegie and Murrumbeena and City of Glen Eira and should be conserved as one of the cultural assets of the city. … Frogmore House should be included in the schedule to heritage over lay clause 43.01 by the Glen Eira Planning Scheme”. The National Trust supports the findings and recommendation of the 2015 Frogmore Independent Local Heritage Assessment. On 9/6/2015, although nothing has occurred that would alter the 2015 Frogmore Local Heritage Assessment findings or recommendation, the resolution not to proceed to a hearing before an Independent Planning Panel was made, based on a casting vote. In the absence of 3 Councillors which included the Mayor and Deputy Mayor (apologies from the Mayor and Deputy Mayor Delahunty and Cr. Esakoff declaring conflicts of interest which had arisen since their participation in the 3/2/2015 resolution to commence the protection process), the immediate past Mayor (Cr. Pilling) took the chair and the casting vote. The voting was 4 to 3. Voting to continue the amendment process – Crs. Sounness, Okotel and Lobo. The 2015 Frogmore Independent Heritage Advisor’s Local Assessment should supersede the 1996-2003 Glen Eira Municipal Heritage Survey, which excluded Frogmore from a local heritage overlay. However, support for the withdrawal/abandoning of the Amendments C136 and C137, is reliant upon the 1996-2003 Heritage Survey. A survey which contradicts the findings and recommendation of the 2015 Independent Heritage assessment. The need to consider Frogmore in the context of the municipality (9/6/2015 Officer’s Report) does not justify abandoning the planning scheme amendments. Nor does it recognise that the detailed 2015 Frogmore Heritage Assessment was undertaken at the Local Level. Asserting that the 2015 Frogmore Local Assessment recommended protection “because” of associations (refer Officers Report – 9/6/2015) “downplays” the 2015 Local Heritage Assessment’s recommendation that is based on a detailed assessment of Frogmore’s historic significance, architectural merit, rarity and associations. Inappropriately referencing Heritage Victoria’s March, 2015 Assessment (which did not recommend State Level Protection), “blurs the line” between State and Local Assessments. When a State Assessment recommends State Level Protection, local level protection automatically follows. Conversely, the absence of State Level protection does not, and should not, impact recognition of significance at the Local Level. Frogmore not being located in an “identified heritage area” – this is not a current heritage assessment criteria and arguably a stand-alone location enhances, rather than diminishes, heritage value. Obscured street visibility (due to extensions) – not a heritage assessment criteria and able to be addressed during re-development. Non original modifications – the 2015 Frogmore Local Assessment did not find these modifications significant. Does not adequately consider the National Trust’s recommendation to preserve Frogmore via the applying a local heritage overlay. – objectives of planning for Victoria, as identified by the Planning and Environment Act 1987. The supporters of these amendments (C136 and C137) agree with the objectives and purposes of these documents and have consistently argued that good planning should result in an outcome that would retain Frogmore for current and future residents without preventing redevelopment (Aged Care or other permitted use), albeit a “scaled back” development. The protection of heritage values is a valid planning consideration in planning decisions. The site is a large site (8,000 sqm, of which approximately 1,000 sqm accommodates Frogmore House and its significant vegetation identified in the 2015 Frogmore Local Heritage Assessment) that presents a unique opportunity for a good planning outcome that caters for multiple community usages, ie. preservation of heritage and redevelopment as an Aged Care Facility that is consistent with and encouraged by the above documents. Abandoning Amendment C137 will not put in place orderly planning controls that conserve and enhance buildings identified as significant while also providing for sympathetic redevelopment that balances the present and future interests and needs of Glen Eira’s residents. The suggestion that planning issues (particularly those related to heritage issues on large lots) are more appropriately addressed during the planning permit approval process (Officer’s Reports 3/2/2015 and 9/6/2015) is inconsistent with the above documents and will result in ad hoc, piecemeal decisions. The planning permit process only considers planning controls that are in place – no heritage controls = no Frogmore. Abandoning Amendment C137 will not provide an appropriate forum to consider Frogmore’s heritage. It is extremely difficult to see “The Minister for Planning has, to date, not responded to Council’s request of 4 February 2015 to place interim heritage control over the land” as a justification to withdraw/abandon the amendments. No plans for the proposed redevelopment have been lodged with Council and, contrary to Officer’s Reports (3/2/2015 & 9/6/2015), the site has yet to be acquired by the potential developer. The sales agreement is conditional upon obtaining planning approval. Net Community Benefit (NCB) – refer 9/6/2015 Officer’s Report (Section 6 Public Notice – Objectors), is frequently mentioned yet rarely documented or quantified. Recent discussions determine its value as being 120 beds. No detailed professional analysis substantiating this determination (that NCB = 120 beds) has been presented. The potential developer’s optimal proposed development comprises a 120 bed facility and the loss of Frogmore. Despite the 2015 Frogmore Local Heritage Assessment, this NCB determination clearly assigns a zero value to heritage. That the potential developer had acted in good faith, undertaken due diligence and incurred significant costs in identifying the property as suitable and plan preparation (Officer’s Report’s 3/2/2015 & 9/6/2015 and Councillor discussion). While this is a regrettable situation, it is however, not a strategic justification for abandoning the heritage protection process. That by abandoning the heritage overlay process, the potential developer avoids lengthy delays in site redevelopment. This is not a strategic justificiation for abandoning the heritage protection process. It sets a dangerous precedent if unsubstantiated Net Community Benefit, “good faith”, costs incurred by the developer and the avoidance of developmental delays are deemed to provide sufficient justification for abandoning the planning scheme amendments. The protection of heritage values is a valid planning consideration in planning decisions. – decides an appropriate course of action ie. either deny Council’s application to withdraw or abandon Amendments C136 & C137 or use Ministerial Direction to ensure that an appropriate heritage recognition process is undertaken. Following on from our request for residents’ assistance in lobbying Councillors not to vote for the recommendations included in the Officer’s Report, ie. abandoning Planning Scheme Amendment C137 to apply a Local (Municipal) Level Heritage Overlay (HO154) on Frogmore House (1 Wahgoo Street, Carnegie). this posting will focus on the rationale, presented in that report, for the above recommendations. Is Frogmore House worthy of heritage protection at the local (municipal) level? The Council commissioned 2015 independent heritage advisor’s local (municipal) level assessment says it is. Nothing has occurred to change that assessment. Addendum (added 9/6/2015) – Please note, the above comment was based on residents’ advice related to their discussions with Heritage Victoria as to the Heritage Council of Victoria’s 4/6/2015 decision. Subsequent advice (received from Cr. Hyams) states that “I have been informed that Heritage Victoria is recommending to Council that we consider applying the local heritage overlay to Frogmore, not that we apply it.”Given the above differing versions, we now believe that any decision made, prior to receipt and review of written advice from the Heritage Council, would be premature. The National Trust has advised that the Trust will be making a similar recommendation for Council to apply a local heritage overlay. Protecting places identified as having architectural, cultural or historical significance. Ensuring sympathetic redevelopment and renovation of areas and places identified as having architectural, cultural or historic significance in the municipality. Enhance knowledge and popular understanding of Glen Eira’s architectural, cultural and historic heritage. Balancing the present and future interests of all Victorians. Does the Officer’s Report present sound reasons in support of its recommendation to abandon local level heritage controls? These reasons are presented the reports Section 8 – Basis for Recommendation .
. “blurring” the boundaries between Local and State Level Heritage Protection+.
. not considering that the Glen Eira Planning Scheme provides for both heritage retention and re-development to meet community needs. +On 3rd February 2015, Councillors voted to “Initiate a heritage protection process” and by doing so did not support an alternative proposal to “Not re-open the heritage issue at a municipal level but abide by whatever decision is made by the Heritage Council”. Consequently, the resulting Planning Scheme Amendments (C136 and C137) relates to Local Level Heritage Protection and not State Level Heritage Protection*. Heritage Victoria’s finding not to recognise Frogmore’s significance at the State level is simply not relevant to any discussion on Frogmore’s significance at the local level. How best can I represent residents?
. Ensuring that a good planning outcome is achieved by recognising that both heritage and redevelopment can co-exist. A good planning outcome is not one that forgoes heritage to provide for redevelopment maximisation. We are struggling to understand how this can be considered a reason for recommending abandoning the local level heritage protection process – a local level heritage assessment has been undertaken and recomends heritage protection. In addition, Council has received a recommendation from Heritage Victoria to apply a local Heritage Overlay to Frogmore and, if not already received will shortly be receiving, a similar recommendation from the National Trust. Residents are wondering how many assessments recommending heritage protection are required by Council. “The 2015 assessment (Graeme Butler Report) found 1 Wahgoo Road, Carnegie should be included in the heritage overlay because of its link to early developers of the city, a former Councilor and the son of the architect of the Caulfield Town Hall”. “Associations” (ie. links to the life, or works, of a person or group/s of persons) is a valid factor in determining heritage significance. “Associations” is one of many factors included in heritage criteria used by the National Trust, Heritage Victoria and Council. However, to imply that the 2015 recommendation was made “because of it’s link to early developers of the city, a former Councillor and the one of the architect of the Caulfield Town Hall” diminishes the substance/content of that assessment. a comparison of Frogmore with other properties in Glen Eira. Historic Significance – demonstrates pattern of settlement and growth of the Municipality development and the dominance of pastoral activities into the early 1900’s. Rarity – As a late 1880’s former farm residence, Frogmore is rare within Glen Eira where other surviving Victorian-era building stock were residences of professional Melbourne City workers and are not associated with working farms. Archibald McLauren (significant association), a pioneering pastoralist, notable in two colonies (NSW and Port Phillip) who is attributed with commissioning the design and construction of Frogmore. Frogmore House was designed by Sydney W. Smith (son of architect Sydney William Smith who designed Caulfield Town Hall) early in his long and distinguished career. No other known example of Sydney W. Smith’s 1880’s work directly parallels the design. Of the buildings designed by the Smith’s, only the Caulfield Town Hall (father) and Frogmore House (son) survive in Glen Eira. Condition – The condition of the building is good. Except for one, all building alterations (i.e. newer building annexes which tend to obscure the view of Frogmore and are excluded from the the proposed heritage overlay) have been largely superficial. Residents have also commented that the buildings continued usage as an aged care facility until December, 2014, indicates that Frogmore’s structural condition is sound and internally is well maintained. Both of the above comments relate to State Level, rather than Local Level, Heritage Protection and as such they have little, or no, bearing on Planning Scheme Amendments C136 and C137. The Minister for Planning has, to date, not responded to Council’s request of 4th February to place an interim heritage control over the land. Rather than providing a basis to abandon the request, this is a reason for “follow-up”, particularly as the Interim Protection Order applied by Heritage Victoria expired on 17th May, 2015. “Frogmore House is significant to the City of Glen Eira historically and aesthetically … and should be conserved as one of the cultural assets of the city”. “Frogmore House should be included in the schedule to heritage over lay clause 43.01 by the Glen Eira Planning Scheme”. The City of Glen Eira Heritage Management Plan assessed it at the local level, in the context of the municipality. It was assigned a “C” grading. It did not recommend it for permanent heritage protection. The 1996 City of Glen Eira Heritage Management Plan as it pertains to Frogmore should be superseded by the Independent Heritage Advisor’s Local Level Heritage Assessment. The 1996 Heritage Management and the results of 1996-2003 Municipal Heritage Assessment are now over a decade old. Given the changes in social attitudes and demography that have occurred in that decade, Council should consider undertaking another Municipal Heritage Assessment. 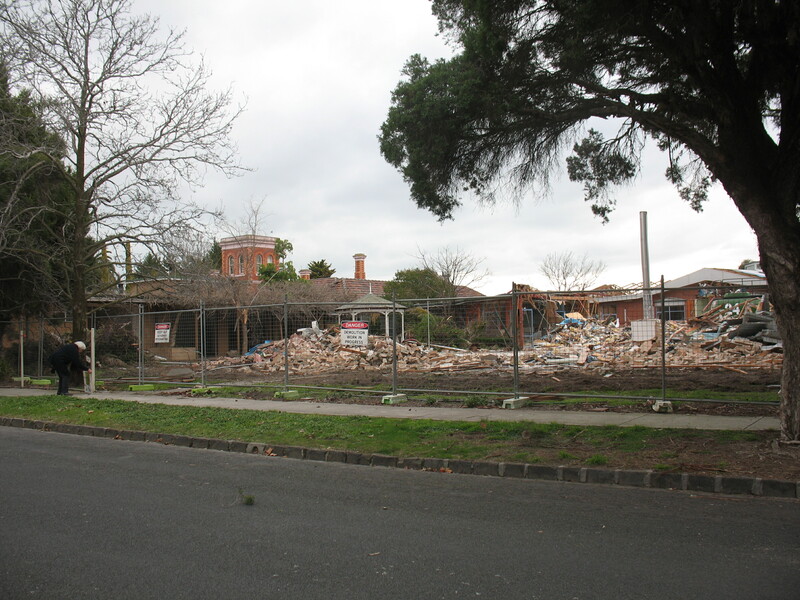 Council is reminded that without any permanent heritage controls, the planning permit approval process does not ensure the preservation of heritage – under the Glen Eira Planning Scheme, unless permanent or interim controls are in place, a demolition permit may be issued without first obtaining planning permit approval. This evidenced by Council’s (January, 2015) initiation of interim protection order on Frogmore. Local Heritage Controls – Protects places identified as having architectural, cultural or historical significance at the local level. Planning Permit Approval Process – Ensures sympathetic redevelopment and renovation of areas and places identified as having architectural, cultural or historic significance in the municipality. support proceeding with the heritage protection process as included in Planning Scheme Amendments C136 (Interim Protection) and C137 (Permanent Protection). Council’s responsibility to ensure that planning schemes have a sound basis and that good reasons should be provide when expert advice is disregarded. redevelopment without the loss of recognised heritage assets. Assigned a zero value to heritage preservation. This is contrary to well established planning principles that recognise and value heritage retention – such a valuation should be undertaken by accredited professionals and the results may outweigh the NCB value of 60 beds. Within Australia there are three levels of Heritage Protection or Registration, in line with the three tiers of government, each level of assessment is undertaken by different authorities. Australian – National Trust – significance assessed at the National Level eg. building the stock is assessed by comparison with other buildings in Australia. Local – Local Authorities (Councils) – significance assessed at the Municipal Level, eg. the building stock comparative assessment is restricted to the Municipality. Under this structure, the way people live is recognised by enabling protection for local icons. 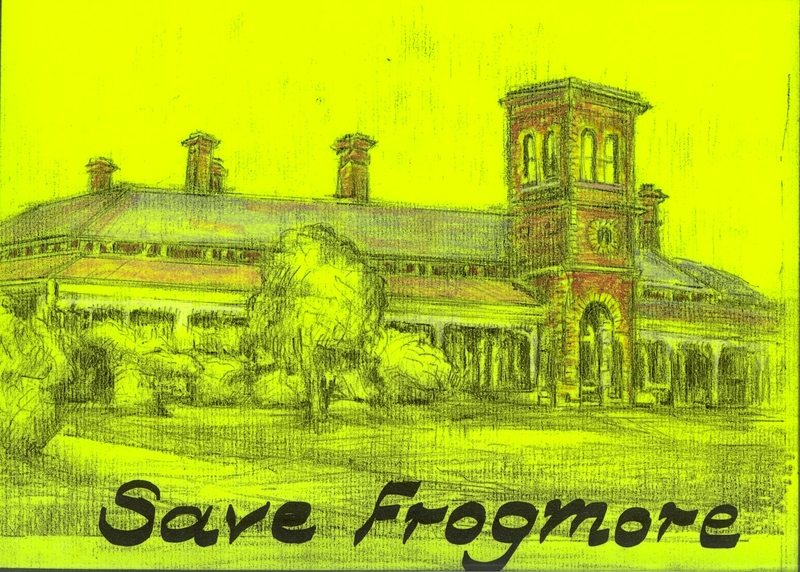 On behalf of the Save Frogmore campaigners, GERA is asking readers to assist in lobbying Councillors, prior to next Tuesday’s (9/6) meeting, to reject a recommendation to abandon Planning Scheme Amendment C137 which applies a Heritage Overlay (HO154) on Frogmore House (1 Wahgoo Street, Carnegie). re-affirming the findings of the council commissioned Independent Heritage Advisor’s Assessment, which deemed Frogmore as meeting the threshold for inclusion in the local heritage overlay under Clause 21.10 of the Local Planning Policy Framework – a framework which Council has a responsibility to uphold. allowing the planning approval process, as recommended by the Independent Heritage Advisor Assessment, and voted for by Council on 3/2/2015, to run its due course (and save Frogmore for at least as long as the planning approval process takes). As previously mentioned our next posting will review and question the Officers Report and it’s recommendation, however, at this stage that is a secondary concern. Right now our primary concern is “getting the word out” and encouraging readers to contact each Councillor, either by phone (leave a voice message if necessary) or email (to each Councillor individually – if the email is addressed to multiple Councillors only first Councillor will respond), prior to next Tuesday’s Council Meeting. Please do not rely on others to do the lobbying – they are relying on you. The third* part of the residents’ campaign to save Frogmore occurred in early May (6/5/2015) and comprised a Planning Conference related to Council’s Planning Scheme Amendment C137 to apply an Heritage Overlay to 1 Wahgoo Road, Carnegie. Those attending (25+) the planning conference included residents, a representative from the National Trust, the property owner (Churches of Christ – Queensland) and the potential purchaser (Jewish Care). In addition to those attending Council advised receipt of 303 letters supporting the Heritage Overlay and 2 letters opposing Heritage Overlay. While Council’s objective of a planning conference is not to make a decision but rather to provide “a public and open forum where discussion of the proposal can occur between the parties with a view to identifying affected resident concerns, possible means for addressing the concerns and opportunities to improve the proposal” , the attending residents did not believe that objective had been achieved. 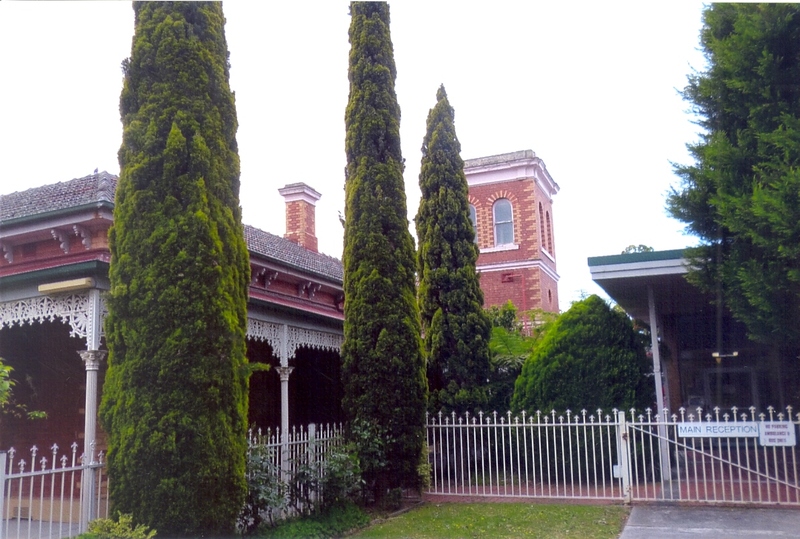 The residents believed the 8,000 sqm site presented a unique opportunity for a redevelopment proposal that could both preserve Frogmore’s heritage significance (as identified and recommended by Council’s Independent Heritage Advisor) and accommodate an Aged Care Facility (albeit a scaled back facility). 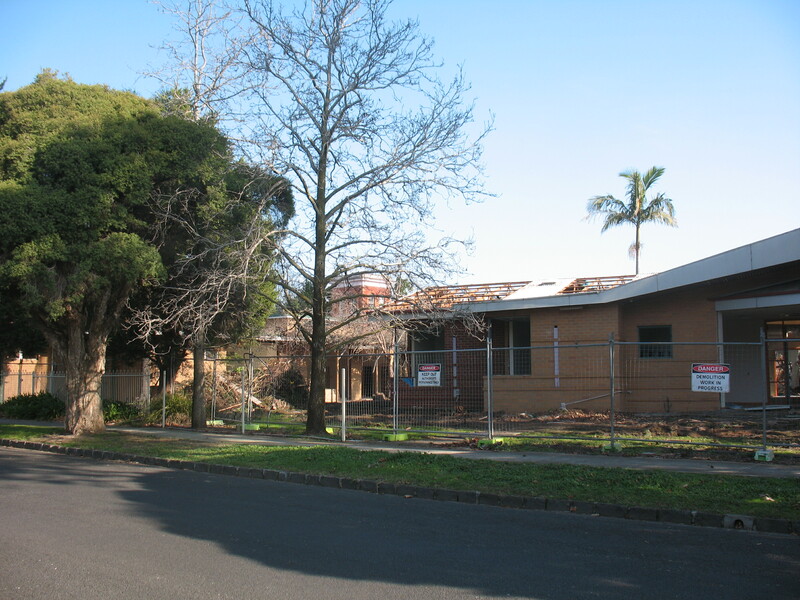 However, the potential purchaser* (Jewish Care) expressed the view that optimum redevelopment of the site for an Aged Care Facility did not allow for the retention of Frogmore and gave little consideration to a less than optimum redevelopment. As a result of this inability to reach common ground residents hold grave concerns for the retention of Frogmore – Council is to discuss the planning conference outcome and decide whether to continue or abandon Amendment C137 at next Tuesday’s Council Meeting (9/6/2015). * Please note that at the Planning Conference both the potential vendor (Churches of Christ, Qld) and the potential purchaser (Jewish Care) stated that ownership of the property has not changed hands and that the sale remains, as stated in the October, 2014, media releases, a conditional sales agreement dependent upon planning approval. Before outlining the planning conference discussion, the following is a brief summary GERA’s 2 previous posting’s and Council’s independent heritage advisors report. This will make for a longer than average post but should draw our previous postings together. October, 2014 – Churches of Christ (Qld) and Jewish Care announce conditional sale and proposed redevelopment of site (1 Wahgoo Road, Carnegie). The sale was (and still is) conditional upon obtaining planning approval. 16/12/2014 – Residents lodge petition (1,000+ signatures) requesting heritage recognition for Frogmore. Council passes motion for an independent heritage assessment to be undertaken. 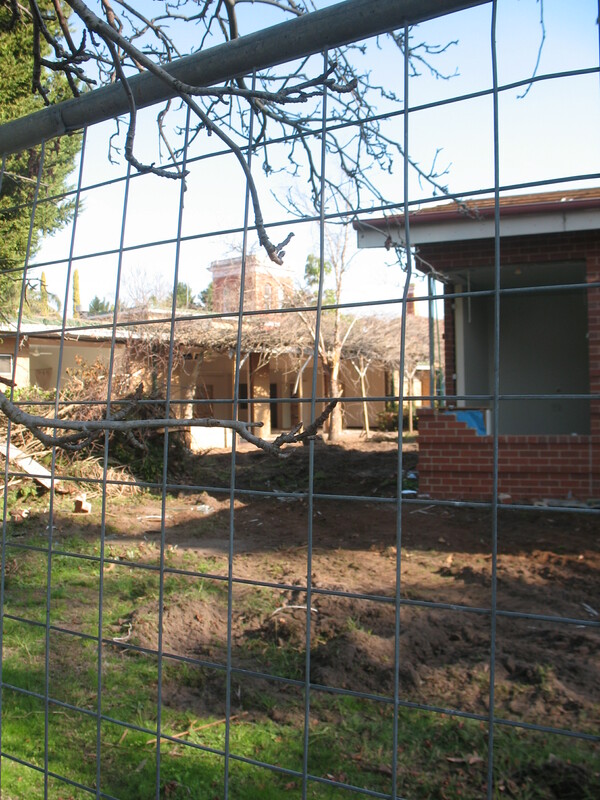 January, 2015 – Council obtains an Interim Protection Order on Frogmore to prevent demolition prior to Council formalising the decision to protect, or not to protect, Frogmore. 3/2/2015 – Independent Heritage Advisor’s (Graeme Butler) report which recommended Municipal Heritage Protection, together with a highly questionable unnamed Officer’s Report, submitted to Council. Council voted 6 to 3 (For – Sounness, Okotel, Lobo, Delahunty, Esakoff and Magee; Against – Pilling, Hyams and Lipshutz) to apply Heritage Protection at the Local Level as recommended by the Heritage Advisor and in accordance with Clause 21.10 of the Local Planning Policy Framework. 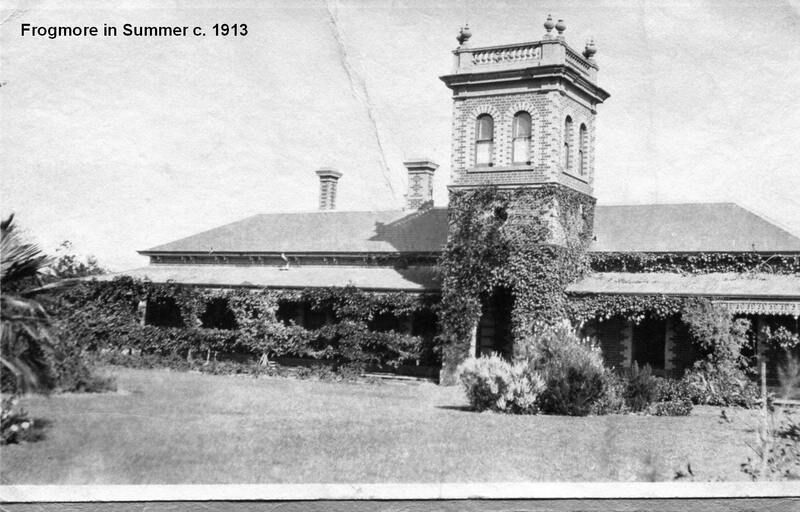 13/3/2015 – As a result of Save Frogmore Campaigners’ submissions requesting State Level Heritage Protection, Heritage Victoria published its assessment and did not recommend State Level Heritage Protection (Heritage Victoria Assessment) . This assessment, and petitioners’ subsequent submissions, to be reviewed by Heritage Council early June, 2015. 6/5/2015 – Planning Conference of Amendment C137 Heritage Overlay on Frogmore. 9/6/2015 – Council decision to abandon or continue applying the Heritage Overlay. Before summarising the above report, readers should note the report disagrees with the construction date of Frogmore House. The Save Frogmore campaigners believe the surviving house was constructed in 1857 (which would enhance Frogmore’s heritage significance via association with renowned architect Joseph Reed and the original owner – pioneering pastoralist William Lyall) whereas the advisor’s report gives a construction date as 1889 (which excludes the Reed/Lyall associations but retains the association with pastoralist Archibald McLauren (second owner) and subsequent owners while also attributing architectural design to noted architect Sydney W. Smith). “Frogmore House is significant to the City of Glen Eira historically and aesthetically … and should be conserved as one of the cultural assets of the city. By Association – with designing architect and the achievements, cultural and spiritual associations of owners. All residents voiced the opinion that good planning resulted in planning outcomes that enabled both heritage retention and sympathetic redevelopment of large sites – on such sites, good design should enable heritage retention without preventing redevelopment and redevelopment without the loss of recognised heritage assets. In this instance, and in line with Glen Eira’s Community plan, both heritage preservation and the provision of Aged Care Facilities were seen as compatible uses that respond to the community’s needs. Frogmore House is the only surviving, recognised heritage building within the Carnegie/Murrumbeena area. As more and more quality period homes are lost forever to more intensive development Frogmore’s heritage value increases. While Frogmore has “slipped through the cracks” in past heritage reviews, the Independent Heritage Report now imposes a duty on Council to recognise Frogmore’s significance by preserving it for current and future residents. The significance of heritage to fostering the development of a community and a sense of identity is both well documented and widely acknowledged. Except for one, all building alterations (i.e. newer building annexes which are excluded in the proposed heritage overlay) have been largely superficial. 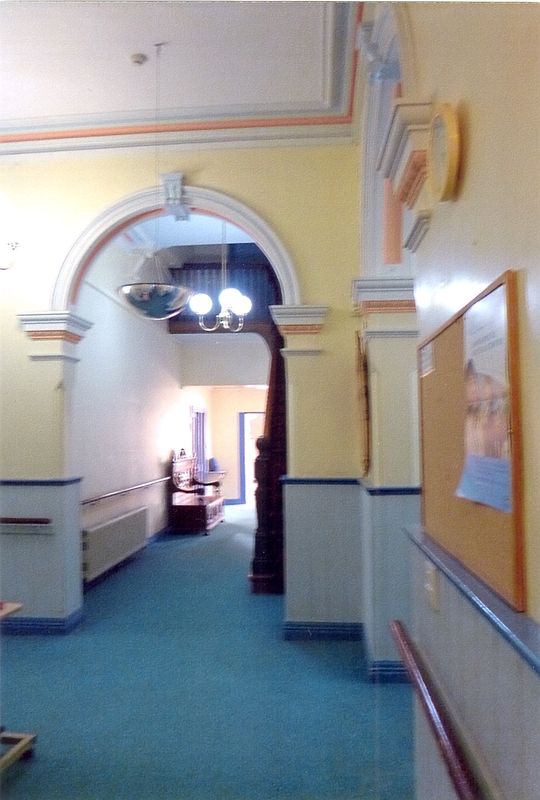 In addition, the buildings continued usage as an aged care facility until December, 2014 (when the Betheden Aged Care Facility was closed) also indicates that Frogmore’s structural condition is sound and internally is well maintained. contradicts the report’s subsequent comment that, “any party, notwithstanding the 1996-2003 assessment, has the ability to request/justify the addition of a property to the Glen Eira heritage register”. while recognising Frogmore’s significance gave it a Grade C category which excluded it from inclusion in a heritage overlay because it was not located “within an identified heritage area” – arguably (then and now) Frogmore’s stand-alone location rather than detracting from its heritage significance, actually enhances that significance. This much earlier heritage assessment did not include associations that were included in the 2015 assessment and arguably it should have. Protect places identified as having architectural, cultural or historical significance. Ensure sympathetic redevelopment and renovation of areas and places identified as having architectural, cultural or historic significance in the municipality. Provides proximity to various facilities (shops, services, public transport) that enhances the aged care residents’ independence. contrary to the officer’s report stating that the property had been sold, at the Planning Conference both the Churches of Christ (Qld) and Jewish Care stated that property has not been sold and the sale remains conditional pending planning approval. That the property’s location does not provide facility residents with convenient access to local shopping or service centres. Facility residents will need to access these centres by either private vehicle or the Murrumbeena Road bus service. The decision to close the facility was the result of legislative changes (related to residential aged care accommodation standards) that, in their view, made redesign of the facility impractical and the sale of the property (with resulting funds being available for other charitable operations) the more attractive alternative. Had been seeking potential sites to provide their community with aged care facilities for a period of time and had the selected the site because of its size and proximity to services and facilities. Sites of this large size were not readily available in Glen Eira and the Planning Scheme’s continuous use* clause would enable the construction and operation of an Aged Care Facility in a Neighbourhood Residential Zone. * The concept of continuous use (also known as existing use) provides for a previously legal or permitted use to continue even though subsequent changes to the planning scheme may now prohibit that use. Please note that residents objection to the proposed redevelopment focused a scaling back of proposal that would accommodate both heritage preservation and aged care facility use. No resident objected to continuous use of the site. In assessing a site’s potential, the proposed purchaser used modelling tools (comprising many diverse factors, including Legislative requirements and Planning Scheme constraints) for either a 60 or 120 bed facility. If the total site was redeveloped the site could accommodate the 120 bed model, however, if Frogmore was to be retained, the location of the house on the lot would constrain the redevelopment to a 60 bed facility. While the potential purchaser appreciated heritage, in their view, building a 120 bed facility represented a Net Community Benefit (NCB) of 60 beds which outweighed Frogmore’s heritage value. Based on this analysis, the potential purchaser was reluctant to consider a smaller facility for the site and would prefer to seek alternate sites. It is up to the Glen Eira Community and due Planning Processes (which provides for community input) to determine what constitutes Net Community Benefit. That the arithmetic equation (ie which is based solely on the difference of what could be built if Frogmore is not retained vs. what could be built if Frogmore is retained – NCB = 120 – 60) is simplistic and assigns a zero value to heritage preservation. This is contrary to well established planning principles that recognise and value heritage retention – such a valuation should be undertaken by accredited professionals and the results may outweigh the NCB value of 60 beds. In addition, little evidence or justification was provided to support use of only two models. The National Trust Representative offered the Trusts assistance with the proposed redevelopment’s planning and heritage issues. Although this offer was not responded to at the Planning Conference, follow-up is anticipated to occur. Presumably in support of the zero heritage value, the potential purchaser commented that Victoria Heritage had not recommended State Level Heritage Protection for Frogmore. Residents outlined the 3 levels of Heritage Protection that exist within Australia. These being National, State and Local – with each heritage assessment application being assessed using similar criteria with, because of the extent of the areas being reviewed, varying standards are applied to each criteria. At the Local level, Council commissioned an Independent Heritage Advisor’s Report which unequivocally recognised the significance of Frogmore and also unequivocally recommended a Heritage Overlay be applied to Frogmore. The potential purchaser indicated that considerable costs had been incurred in both the property search and in preparation of plans. The plans were nearing completion and would shortly be lodged with Council. Please note that, as is customary, these plans have not be publicly discussed with, or shown to residents. Residents knowledge of the plans is limited to the information included in the previously mentioned press releases and the planning conference discussion. Due planning processes are followed to ensure that residents are able to participate in those processes which would include input into the determination of Net Community Benefit and a quantifiable Heritage Valuation by an accredited professional. Due consideration is given to Council’s Independent Heritage Advisor’s Assessment , which deemed Frogmore as meeting the threshold for inclusion in the local heritage overlay under Clause 21.10 of the Local Planning Policy Framework – a framework which Council has a responsibility to uphold. Enhancing knowledge and popular understanding of Glen Eira’s architectural, cultural and historic heritage. Balance the present and future interests of all Victorians. Frogmore is preserved, at least until due planning processes have occurred. Readers should note that continuing with the potentially lengthy, planning scheme amendment process will involve. Frogmore House designed by Sydney W. Smith (son of architect Sydney William Smith who designed Caulfield Town Hall) early in his long and distinguished career. Frogmore is now rare within the Glen Eira because of the combination of age, scale, architectural style and historical associations. Few identified Victorian era Italianate villas have survived in Glen Eira with none identified in the Carnegie/Murrumbeena area (which was relatively unaffected by the Victorian era building boom). Glen Eira’s surviving Victorian-era residential building stock were residences of professional Melbourne City workers and are not associated with working farms. Early associations, via crown land sales, with William Lyall and his model farm. House and Land associations with Archibald McLauren, the dominance of pastoral activities in the Victorian era and the later growth of the Caulfield District via land subdivision and immigration. The cultural and spiritual associations held by subsequent owner/occupiers (Gairdner, Seelemeyer, Menck, Keys, Churches of Christ).